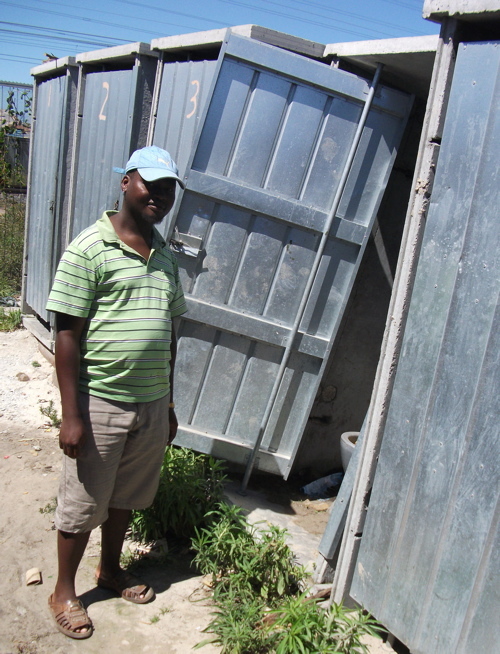 In Khayelitsha’s Island informal settlement up to 25 families have to share a single toilet. Although the city installed one flush toilet for every five families in the area two years ago, the informal settlement has since expanded, and many of the toilets are blocked or don’t have properly working doors. Residents’ committee member Sipho Mafalane said there were over 1 000 shacks in the area now, and only 50 toilets, which meant that if every toilet worked, there would be one for every 20 families. But with some of them blocked, there’s even fewer toilets for the residents to use. Residents said they reported the matter to the city last year but nothing has happened. Mncedisi Latha, 35, said some of the residents didn’t have keys for the locks fitted to the toilets so they broke down the toilet doors. “Once the door is open it’s hard to close it,” said Latha. He said he personally paid someone to fix the doors to the block of toilets close to where he lives and gave keys to other residents. But he said some of the toilets were blocked and the smell was terrible. He said residents who could afford it rather paid to use the toilets at the taxi rank. But City of Cape Town media officer Charles Cooper said the city’s water and sanitation department had never been made aware of the problem. “It has not been reported,” said Cooper.